This book is SO cute. It makes me laugh. I couldn't stop reading it aloud to my coworkers! Such great puns! And the artwork is colorful and friendly. Nothing brings people together like sharing a good giggle. And according to doctors and researchers, telling jokes is linked to higher intelligence, creativity, sociability, empathy, and self-esteem in kids. That’s why the folks at Wee Society created this artfully designed book of jokes and pictures. Inside the over-sized volume are tips for just-right joke telling, a spot for recording people’s reactions, and a riddle to illustrate. It's perfect for little comedians to practice their funny stuff. Ideal for the holidays, for parents who laugh with their kids, and happy occasions of all kinds, this is a joyful book that kids will read over and over again! 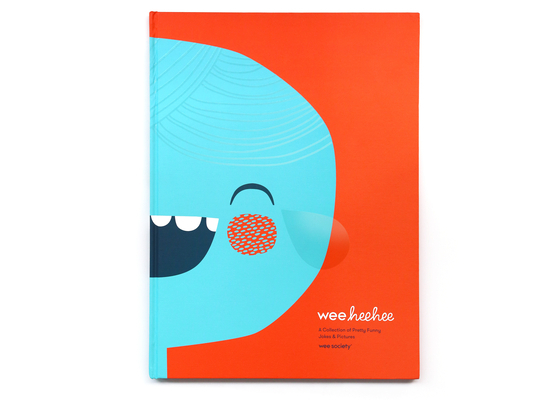 WEE SOCIETY is an award-winning creative studio that believes you’re never too young to develop an eye for design. They aim to spark kids’ imaginations, leading to big bright explosions of creativity. And they’re pretty sure uncontrollable giggles make the world better. With this in mind, Wee Society has created kids’ apps (available in the App Store), books, art prints, toys and still-secret stuff. Their work has been honored by the Parents’ Choice Foundation, Webby Awards and other nice folks.